How Do You Repair A Chipped Tooth? Have you chipped your tooth? Whether the result of an unfortunate sports accident or from biting down on a popcorn kernel, our teeth can sometimes become chipped or broken. How do you repair a chipped tooth? We can use cosmetic and restorative procedures to fix a chipped tooth and return it to optimal health and function. You may assume a broken tooth is not a big deal. However, this is not just an issue with your smile’s appearance. 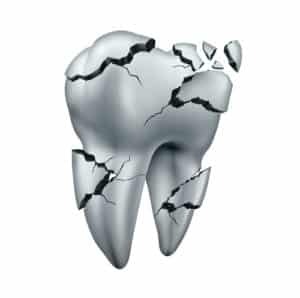 In some cases, the damage could be severe enough to allow bacteria access to more sensitive layers of tooth structure, allowing decay and eventually an infection to develop. You may experience toothaches and in extreme cases, risk losing the tooth altogether. After you chip a tooth we recommend seeing your dentist as soon as possible. On the way, you can place a cold compress on the side of the face to stop swelling and use gauze to stem any bleeding that occurs. With dental bonding we can repair a chipped tooth in a single visit. We clean the tooth and then gently etch the surface. The etching allows the material to better adhere the tooth as it cures. We apply multiple layers of composite resin and sculpt the tooth as it cures under a light. The final step is a thorough polishing for a more natural appearance. We can not only use this to repair teeth, but to also close gaps between teeth and to cover permanent teeth stains. If the damage is too severe for a dental bonding procedure, then we may suggest a crown. We prepare the tooth by removing a small amount of structure and then taking detailed impressions. The impressions are used by a dental lab to design and create the restoration. We then place the crown over the tooth, restoring it completely.